Manmohan Singh is talking, making sense, and India is listening. Rahul Gandhi needs to listen to him too. Most of the commentariat had written Dr Manmohan Singh’s political obituaries nearly five years back. So had I. Did we imagine we will be writing articles about his return as 2018 ends and we enter another election year? He is no longer the silent “Maun Mohan”. He does speak now, although very little, very measured. Usually, just a couple of sentences. But when he does, India listens. Even a routine—and drab as usual—formal speech by him goes viral online. Check social media trends. Anything he says, spreads. He hasn’t suddenly become an election campaigner for the Congress. But in Parliament and outside, he is now its most weighty voice. See the impact of his short, clinical and firm statement on Urjit Patel’s resignation. 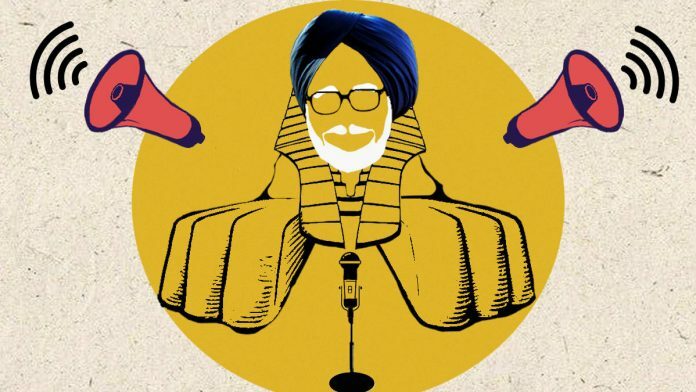 Or, his comment at the release of his books earlier this week, where he said that he may have been called a sphinx, but he wasn’t a silent prime minister. He was never afraid to answer questions from the press. This was brilliantly loaded and skilful political wit, in a “Kahin pe nigahen kahin pe nishana” (aiming somewhere, hitting somewhere else) approach. He used self-deprecation, using an obvious weakness of his own to attack Narendra Modi. A comeback of this kind isn’t bad for a non-politician at 86. Younger partymen, many of whom dissed him in his second term, plotted a switch to a “more political” prime minister, namely Pranab Mukherjee, ran circles around him, got his decisions rescinded by 10, Janpath or theirs thrust on him, have spent their time in the wilderness writing books. They began seeking him out to release them initially, because he had the time and stature: At least enough to dignify your customary group photo holding the book on stage. Lately, such appearances by him make headlines, ensuring greater press for the book, and backing for his party’s politics. He still isn’t a people’s man. He speaks little and chooses his words carefully. That’s been his style ever since he entered public life. When the first scam (Harshad Mehta) hit the stock markets and his government was under a cloud, all he said in Parliament was, “I won’t lose my sleep over the stock market”. But when he spoke to defend his government in the vote over the nuclear deal, he unleashed the most defiant lines from Guru Gobind Singh: Deh Shiva var mohe…Nishchay kar apni jeet karoon (Bless me O Shiva… so I may have the strength to fight until my victory). Then he mocked Advani for continuing to live by his astrologer’s promise that he will become prime minister one day. His second term in 2009 came with higher numbers for his party, counter-intuitively as a reward for his incumbency. People voted him back so resoundingly not because they saw him as a weak or meek leader. He had just risked his government, braved a desertion by the Left, in defence of his philosophical belief that India needed to make a full strategic shift: The real import of the nuclear deal was an embrace of the US as an ally. He was rewarded for being strong. Later, philosophically, when Modi took his policy forward instead of reversing it. What happened subsequently, ‘National Interest’ tracked in detail, including in a 2015 piece when I said he had let himself and his fans (including this columnist) down by not resigning when his party bosses were undermining him and his office. The provocation for that article was the pain at seeing him being questioned by the CBI in connection with a coal scam case. Modi also mocked him in Parliament for claiming to be clean while allowing corruption under his watch with that “standing in the shower in a rain-coat” line. He was still a soft target. It was probably demonetisation in the winter of 2016. Manmohan Singh spoke little, but an uncharacteristically cutting and memorable line: “Organised loot and systematic plunder.” This was the first time his own party seems to have realised the weight he still carried. Demonetisation was a sitter for him because economics is his domain. Later, as the economy drifted, professional economists in key positions left, “fixing” of data began, and a sense of crisis grew, his words were sounding prophetic. In the marketplace of politics, as in any other, product-differentiation is invaluable. One reason he is again being taken seriously is that in this bitter, broken politics, there is a premium on dignity and decency. When Narendra Modi calls Sonia a rent-seeking “vidhwa” (widow) and Rahul Gandhi says “chowkidar chor hai” (the watchman, or the prime minister, is a thief), Manmohan Singh stands out for classiness even in his criticism. He is not the only one. That Shivraj Singh Chouhan in Madhya Pradesh nearly swung the miracle of a fourth term despite farm strife underlines the premium people now also put on understated humility. In my ‘Walk the Talk’ interview, I had asked P.V. Narasimha Rao what did he bring to the table when he had so little charisma, oratory or political weight. “I bring solace,” said the old man. As Manmohan Singh’s political mentor, he would’ve been happy to see himself make the same contribution—at least for his party. Because, if Rao brought solace to a crises-ridden India, Singh is bringing solace and credibility his reviving party needs. There is, however, a big difference between the post-retirement lives of the two former prime ministers. The Congress saw no utility in Rao once power was lost. He was dumped. He fought his corruption cases all by himself, and died a lonely but vindicated man, having been cleared in all cases. The party would have done the same to Manmohan. He, with his “anti-poor” reform economics and inability to prevent scandals, would be the ideal man to blame for that 2014 disaster of 44. Another A.K. Antony report would have said pretty much what the first said while blaming Rao and his “suit-boot” economics for the 1996 defeat. Three things made a difference: First, the personal affection in which the Gandhi family held Manmohan Singh. Second, the impact it saw him make with his initial statement on demonetisation. And third, the judicial unravelling of all the mega-scams of his tenure, notably 2G and coal. Which brings us to our final point, and a question. Will Rahul’s Congress just leverage his voice now, or also listen to him? Singh, who lives very modestly, has been the greatest wealth-creator for India in its modern history, and the least judgemental about the legitimate, tax-paying rich. Check all data from 1991 onwards. He’s a man of no riches, but had no prejudice against wealth-creation in this deeply, hypocritically socialist polity. He is the only prime minister with the conviction to use an expression like revive the “animal spirit” of the country’s economy. He also had the intellect to acknowledge that growth inevitably creates inequality. It is then for the state to intervene, redistribute and support the poor who, in turn, can’t be left to the mercy of the markets. He must watch in great concern as his party, under Rahul Gandhi, unleashes an economic rhetoric of its distant, disastrous past, where “Ambani-Adani” are what evil “Tata-Birla” were to the 1970s, when loan waivers are showered from campaign helicopters and holy PSUs are back in full glory. He must wince as Rahul goes plugging HAL as the best company to make a frontline Western fighter jet like the Rafale. Singh would know it can’t happen. The question, therefore, is with nothing to lose now, will Singh give Rahul a tutorial on modern, reform economics? Or will he again lapse into his 2010-14 “what-can-I-do” type helpless self-pity? We need to also watch if Rahul will listen to him this second time around. 14 years too late. His “Talking” now is totally meaningless and is perceived more as a symbol of his unfailing and obsequious loyalty to Mrs Gandhi rather than any public spirited service to the nation. He stood and watched silently ( a sign of benign approval) when he ought to have spoken and acted. 1. I think if Shri man Mohan Singh is a pragmatic politician. He should advise Congress President Shri Rahul Gandhi to be a statesman. A true statesman would gracefully accept that problems of ordinary citizens of our country, of landless workers and of small & marginal farmers are not same as those who are economically better-off. 2. I say that until now all past and present Central & State governments have implemented populist schemes for securing votes of small & marginal farmers. These schemes have been of little benefit for the farmers for which they are meant. 3. Real income of a majority of our small and marginal farmers and the poor in urban areas has remained unchanged for many decades and no political party or its leaders have ever been held accountable for this state of affairs. 4. Many economists and bankers have pointed out that benefits of schemes which are meant for small farmers, landless workers and the below poverty line poor in urban areas never reach them. Scheme like waiver of farmers’ loans is essentially a populist measure and it is huge waste public money. Instead of taking steps to increase farm productivity and income of landless poor of the urban poor, politicians often indulge in implementation of wasteful schemes. 5. I think our former PM should kindly advise the Congress President to be honest, sincere and pragmatic. Central & State governments’ first priority would be to implement programmes which will really benefit targeted group of poor urban & rural households. Once this is done, all lessons in economics can follow. Sir, you very well know Rahul knows what he is doing. Anything to win. But Modi does the same. So I don’t think Rahul needs any lessons “anymore”. However being a long term follower of your writings, I do sense the “narrative” you are trying to built. That Rahul is still an underdog and needs lessons. I don’t think this narrative will work. Agree to Diasagree. “Deh shiva bar moh eh hai”……. Its not about hindu god shiv. Its about the supreme power Guru Gobind patshah has mentioned Shiv as mahadev in his writing and clearly mentioned i chaupai about shiv. ” Mahadev ko keht sada shiv, nirankar ka cheenat neh bhiv”…..means – “people are calling mahade as shiv but they don’t even know who is the reallg creator”. So its clear Guru patshah is mentioning akaal purakh not hindu god shiv. We can’t imagine such mistakes from a responsible journalist like u. No need to learn economics to give freebies subsidies reservation loan waivers. Anything else is unpardonable blasphemy in Bharat. The Congress needs to fix its economics. If it gets a second chance, after the showing of 2014, it will be largely because the economy has been totally mismanaged. It simply cannot get on where the incumbent has signed off, waiving farm loans, increasing allocation for NREGA. To begin with, it will have to start creating private sector jobs on a large scale. 2. There was disappointment when both states were given old war horses as CMs. That should not be replicated in Delhi, if the electorate smiles, for FM, bring in Dr. Rajan, as PM PVNR brought in Dr. Singh. Shri Chidambaram has the gravitas and technocratic competence to deal with either Defence or Home, where he proved himself. 3. At 86, Dr Singh is a little old to be a full time Minister Mentor in the Singapore sense. However, his counsel should be sought, not merely as a courtesy but simply because he will help prevent the more obcymistakes from being made. Each newly installed government thinks it is immortal. If there is a UPA III, the Congress should not make that fatal mistake, analyse with sobriety what went wrong after 2014. Shekharji: In this long article, the title is explained in the last 2 para only. All others were about Dr MMS’s personality. How I wish this is the other way around? Rahul is blabbering so much from Gujarat campaign, that this article could have summarised it and seek Dr MMS intervention. SG ji, you are making a mistake. MMS has not got his voice back, but seems to have become not only HMV, but also acquired the habit of throwing stones and running away like HM. It is like Professor Higgins acquiring cockney accent and behaviour from Eliza Doolittle! The problem with the MMS congress rule of 10 years we did not achieve anything as a country, reason behind this is there were growth world over during there first 4 to 5 yrs what they did is populism, as a country we are at the same stage after those growth yrs. look at our road infrastructure it is at same level, agriculture infrastructure no improvement still rely on rain and behind per acre production compare most of the countries, education no improvement, health ( hospital) no improvement. If he spend increase revenue in building these above mentioned asset creation India may be at different level. Because of waste of money during his/Sonia’s rule we are still tlaking about road/health/education/agriculture infrastructure. We do not have that much money and no more world over growth. Second, the linguistic origins of “economics” lie in “political economy”, and for good reason. A political party that sees economics in terms of social reforms will resort to instant gratification and palliatives when it is expedient, and (a conscientious political party will) then follow it up with a more theoretically correct, longer-term measure, such as farm infrastructure reform. When we’re okay with taxpayer’s money to serve the Lutyens (or Vidhana Soudha or whatever) folks, surely we should have no problems with one-time relief. As you know, the rest is PR for public consumption. So, there should be no shame in the way a political leader sees economics differently from a pure-play economist. To suggest that they cannot co-exist is unthought-through (gustakhi maaf!). It is a delightful and necessary conflict. If one drops out when a short term goal is achieved, it’s a sad commentary. My concern is, it’s sad that elections are won on the optics of political economy.